done at a Mazda sponsored event rather than us going to our local dealer and being forced to listen to a salesperson drone on about the car from the passenger seat. Doing these types of events does offer some advantages in the testing of the car, but also has some disadvantages as well. A supervised test drive event like this means that we were able to push the car harder than if we just test drove the car from a dealership. 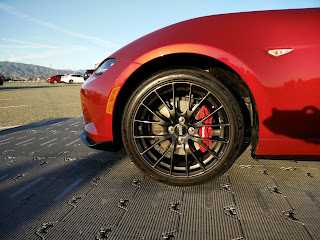 The big disadvantages, however, were that use of the manual transmission car was very limited (limited to second gear, specifically), and we were unable to take the car out on real roads to give a real opinion on how comfortable driving this car would be. Still, my brother and I were quite determined to drive the car as hard as we could without getting kicked out of the event. One of the best parts of the all new, fourth generation Miata, are its looks. Not that previous generations of the car looked bad, but I am definitely glad Mazda decided to move away from the smiley face look of the previous generation. The new car looks much more aggressive while sharing proportions similar to the second generation car. An aggressive new look along with those classic roadster proportions equals an instant win, right? Well...almost. My one criticism of the new Miata has to do with its exhaust. The previous generation car went to the split dual exhaust look, which looks much better to me. I believe that this new Miata could have visually benefited from the split dual exhaust. Instead, Mazda gave it the old single side, dual tip exhaust. 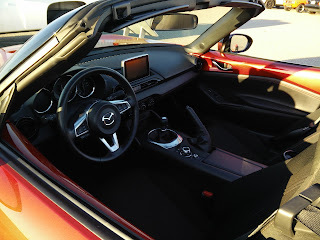 East Brother's theory is that Mazda did this on purpose to differentiate itself from the upcoming Fiat 124 Spyder, which shares the Miata's platform. 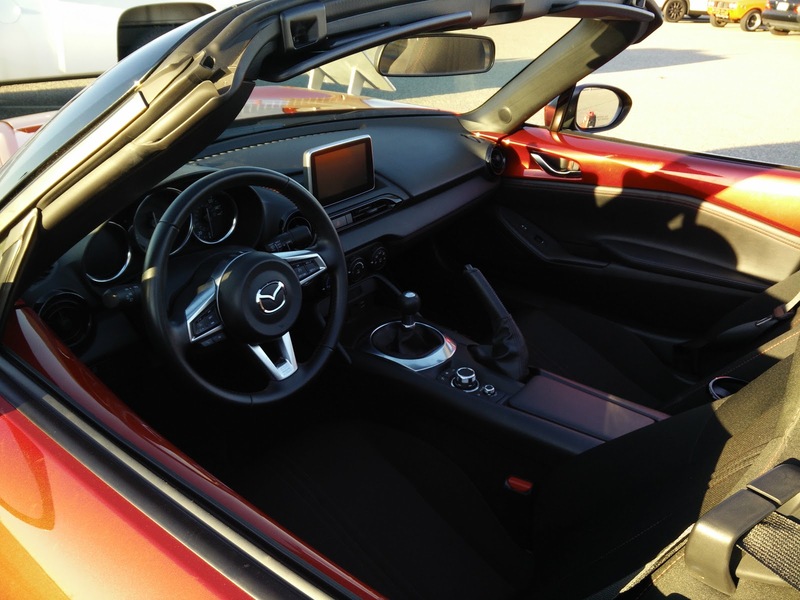 On the inside, the Miata looks as good as ever. My biggest gripe with the third generation Miata was how busy the interior looked with all those buttons everywhere. It looks like Mazda was able to clean up the mess by integrating most of the car's functions into two knobs and a screen. HVAC controls are still separate, which is perfectly fine in my book. Unfortunately, due to the nature of the test drive event, neither East Brother nor myself were able to test any of the gadgets and goodies in the interior of the car. I will say that I am not a big fan of the screen. If it folded away back into the dash, I could have forgiven the "last minute" tacked on look. As far as I can tell though, it just sits there. Comfort was a little difficult to gauge as time behind the wheel was a bit limited and the super smooth surface does not exactly offer a lot of variation. From what I could tell based on our brief stints in the car, the seats were fairly comfortable. I do wish they were more aggressively bolstered though as I felt like I was flopping around a bit during the handling test and hot lap. I also wish the steering wheel were thicker. It might just be because I am so used to my own car, but every single sports car and sporty car I have driven over the last few years have always had thick rimmed steering wheels. Even the steering wheel in our long term RLX feels much more substantial to hold that the one in the Miata. It is a minor issue, but I would just feel a lot more comfortable with a thicker wheel. Obviously, the entire point of this event was to showcase the handling potential of the all new, fourth generation Miata. The first portion was a braking test, performed in an automatic equipped Miata. The goal was to accelerate as quickly as possible, begin braking once we reached a set of bright yellow cones, and to stop the car within the boundaries of a box made with orange cones. I admit that my first run was very conservative since I was still getting a feel for the car. My second run was more aggressive, but I failed to trigger the ABS. East Brother made it a point to brake as late as possible without getting kicked out. If I remember correctly, he was actually able to briefly trigger the ABS during his second run. Needless to say, the Miata brakes incredibly well, due largely to its light weight. 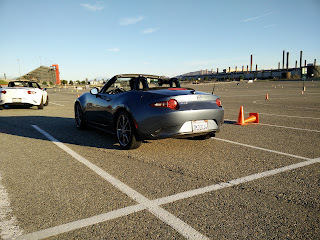 Despite having its brakes hammered on all day, the Miata's pedal stayed firm with very little signs of brake fade. 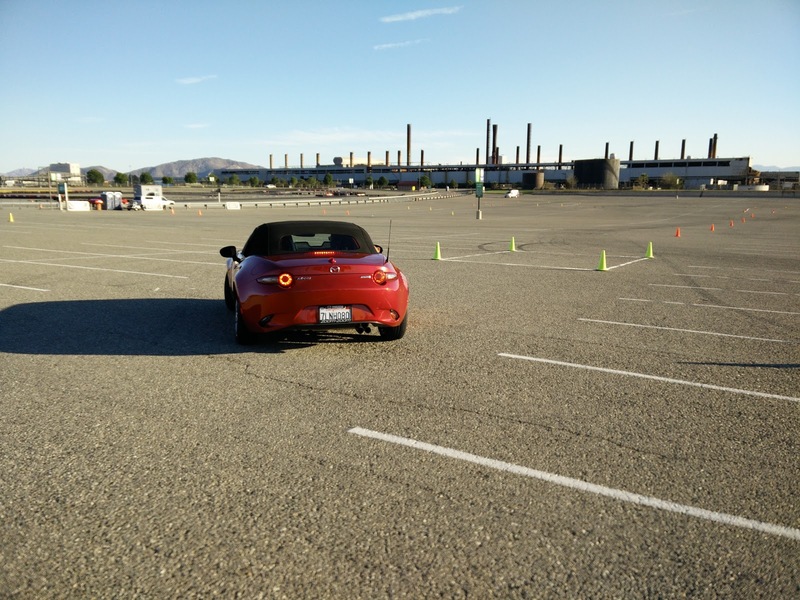 The second test was a slalom course, designed to showcase the Miata's handling capability as well as traction control. It was not a very long course, with a total of five transitions. On my first attempt, I miscalculated the distance between the first and second cones and had to brake hard in order to avoid hitting anything. The sudden braking sort of messed up my momentum for the rest of the run. On my second run, I did much better, also finding out that the Miata rotates incredibly well with just throttle control. While this method got me around the cones much quicker, it was also incredibly hard on the brakes. The Miata being used for the slalom felt like it was just about ready for a new set of brake pads. 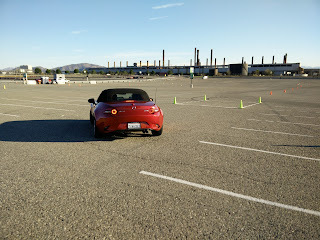 Overall though, the Miata handled the slalom like a champ thanks to its light weight and tossability. It probably could use a little less body roll, but it really is not a huge deal in the grand scheme of things. Finally, we get to the hot lap. Mazda set up a short road course that was designed to show case the car's abilities from the first two tests, as well as acceleration. 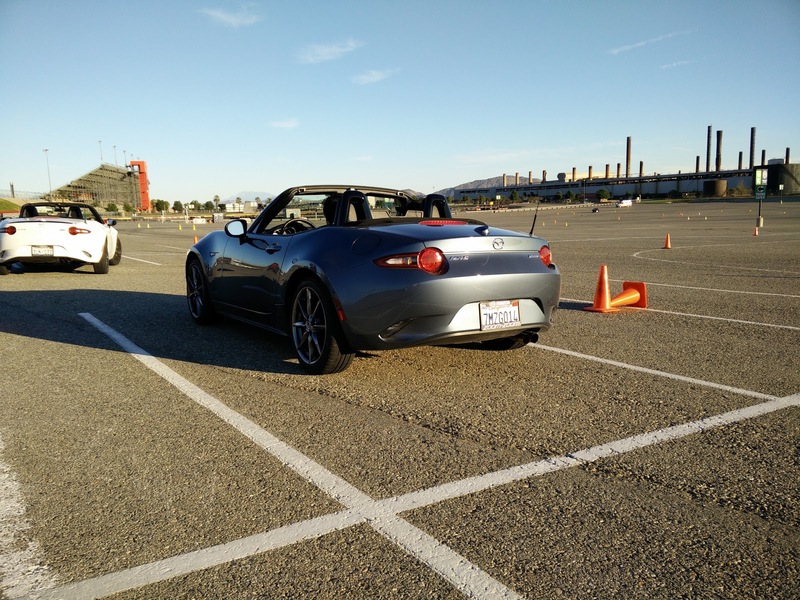 Though we were finally given the choice to drive a manual equipped Miata here, the instructor told us to put it into second gear and just leave it. This was simply just because Mazda intentionally designed the course to be done entirely in second gear. 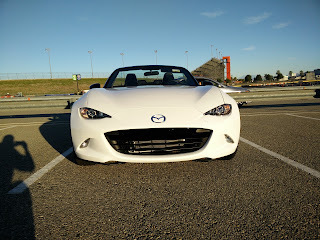 It was a little disappointing as I wanted to get a good feel for the Miata's transmission, but what East Brother and I would do with the Miata during the hot lap would pretty much make up for Mazda's unwillingness to let us hammer on the transmission. As mentioned, this was a short course that could probably be completed within the 60 second range. Even though we were instructed to never take the car out of second after shifting into second, that did not prevent us from attempting to take the car to its handling limits. The course consisted of quite a few turns, which included one long sweeper, and (if I remember correctly) two hairpins. 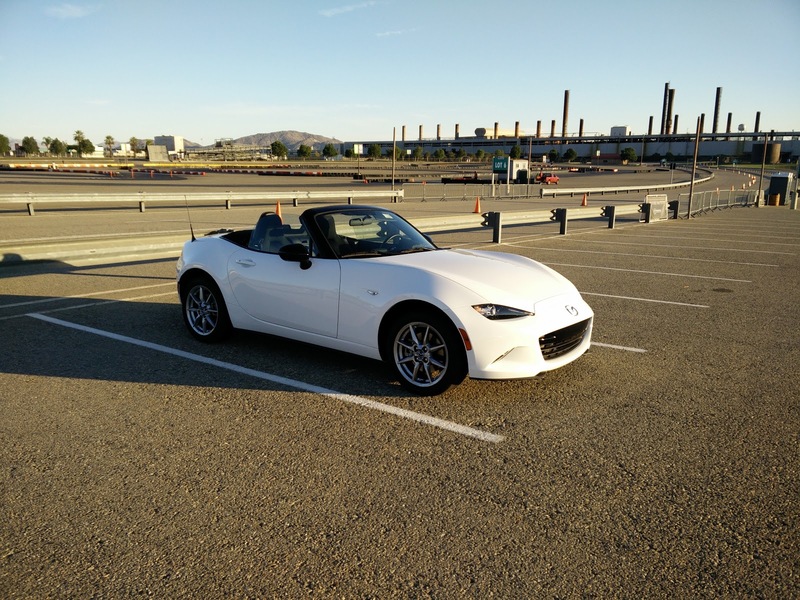 The one thing you should know about a Miata if you have never driven one is that you can reach the car's limits relatively easily. Now, I am not saying this is a bad thing. Being able to reach the car's limits in a controlled environment makes for a fun and engaging vehicle to drive. 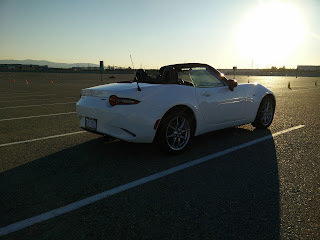 During my hot laps, I was able to just about reach the Miata's limits on the long sweeper as I felt the tail start to come around, necessitating some counter-steering and possibly giving my instructor a little scare. While observing East Brother's laps, it definitely looked like he too took the car right up to the edge. awesome. For the most part, the tests that we participated in are things that we probably would never encounter in daily driving. 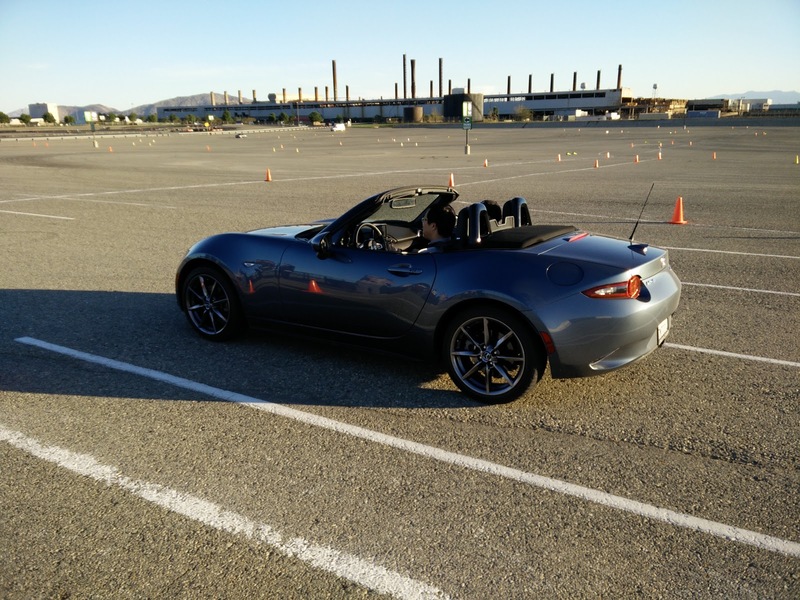 Props to Mazda for giving enthusiasts an opportunity to push the Miata to its limits in a controlled environment. More props for bringing the fun factor back to the Miata. I highly doubt I will be giving up my own car any time soon, but if I had to replace it with something similar, I think the Miata is a very strong contender.